Just heard it on KHON2 sports. He's only a junior though so there's still a lot of time between now and signing day for it to change. I hope he follows through, we could definitely use a qb like him! Re: McKenzie Milton verbally commits to UH! Quarterback McKenzie Milton, who led Mililani High to the state football championship two weeks ago, told the Star-Advertiser he has accepted a football scholarship offer from the University of Hawaii. Milton, who is a junior, is the first member of the Warriors' 2016 class. Milton said he has been a lifetime UH football fan. "All the way from Timmy Chang, Colt Brennan, Bryant Moniz, Davone Bess," Milton said. Of his decision, he said: "It's home, and it's close to family and friends. I'd really like to be able to help turn the program around. I think coach (Norm) Chow is a great coach and I'd like to learn a lot from him. I think he can teach me a lot. He's been there, and he's done that. I look forward to the opportunity they've given me." Milton was 29 of 47 for 421 yards and seven touchdowns in a 53-45 victory over Punahou in the title game. Good to hear. Looking forward to seeing Dayton Furuta from Mililani making a name for himself as well. Last I heard he greyshirted this past year. Welcome to the Warriors, McKenzie! 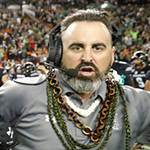 Mahalo for staying at home, becoming a Warrior and helping to turn the football program around. Alright. A lot of good players in the championship game. One of the best games i have ever seen. I hope that we can get our share. This is a good start. That's great, it's a start. I wish some of the other good players follow too. this is the reason i buy my season tickets and attend the games in person: i want to see our local talent playing against the best teams in the nation. That's great. I just wished we had an offense that he or any of our QBs could excel in. Yeah I think we need to go the baseball route and start getting these local boys to stay home and then we need to play them. Other than friends and family, I didn't think it made that much of a difference but just watch when Dyrbe Enos goes into the game at home games. Crowd goes nuts. The Mililani junior quarterback would sleep in his uniform from as young as 4, his mother says. Explain to me because I don't know. He is a high school junior. So he verbally commits. What does that mean? Does it even mean anything? Why is UH sending an offer to high school junior? Shouldn't UH wait to see what he does in his senior year? Is UH on hook if he was to do poorly in his senior year? Can UH make an offer to Al Noga's grandson right now? I'm sure he will be a beast. cabanalane wrote: Explain to me because I don't know. He is a high school junior. So he verbally commits. What does that mean? Does it even mean anything? Why is UH sending an offer to high school junior? Shouldn't UH wait to see what he does in his senior year? Is UH on hook if he was to do poorly in his senior year? But no, it's just a verbal. UH can do the wrong thing and revoke their offer to him and on the other side, Milton could easily decommit and go somewhere else if he gets offers from other schools. Accepting a verbal just hopefully gets other schools not to offer him but they still will even if he has an outstanding year. But i mean, he's had two great years of play. Whether you wanna say it's Mililani's system or not, you must have not seen him play. Kid just makes plays. Neighbor wrote: See Marcus Mariota. I actually don't know much about his story other than, what I read. He sat behind Higgins. Only played one year. Higgins was the Man. UH never even look at him. The rest is history. (Great win over UA). I don't think height will be an issue for Mr Milton as it was not for R Wilson, D Bress, T Detmer & D Flutie. His pocket presence, leadership, quick feet and eyes will be his keys to success. Also, happy top local talent remembers or has a link to former Hawaii players. Hopefully, he has a good career and down the line a youngster goes to UH b/c of him.